Chemists at UC San Diego have created an “adaptive protein crystal” with a counterintuitive and potentially useful property: When stretched in one direction, the material thickens in the perpendicular direction, rather than thinning as familiar materials do. And when squeezed in one dimension, it shrinks in the other rather than expanding, and gets denser in the process. This strange behavior could prove useful for the sole of a running shoe that thickens for greater shock absorption as heel collides with pavement, for example, or to construct body armor that strengthens when a bullet strikes. “It’s a property, called ‘auxetic,’ that has been not been previously demonstrated at the molecular level through design,” said Akif Tezcan, a professor of chemistry and biochemistry at UC San Diego who headed a team of researchers that detailed its invention in an advance online paper in this week’s Nature. Tezcan’s group created a sheet-like crystal made of proteins connected in a regular, repeating pattern. They chose a protein called RhuA for its square shape and used it like tiles to make their material. 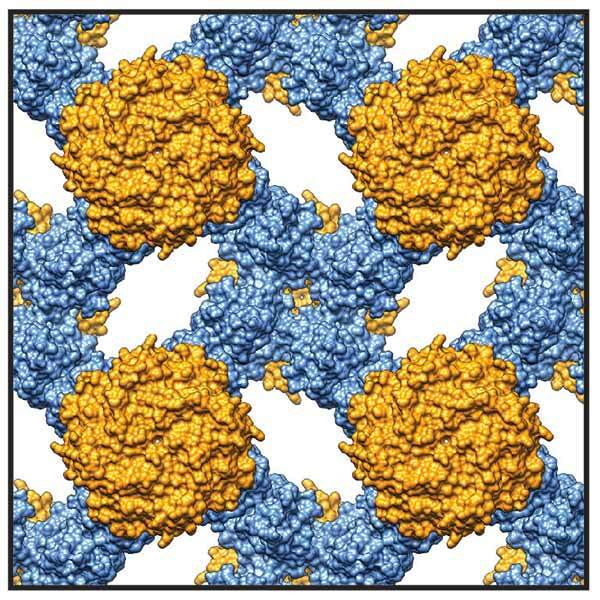 “We found a way to create strong, flexible, reversible bonds to connect the protein tiles at their corners,” Tezcan said. The flexibility allows the tiles to rotate to open spaces for a porous material or to close up in a kind of adaptable sieve. Stretching or compressing the material in one directions causes the connected protein tiles to rotate in unison, resulting in a corresponding expansion or contraction in the opposite directions. The Poisson ratio, usually a positive measure for normal materials that stretch and shrink in opposition, describes this relationship. Tezcan’s group measured a Poisson ratio of -1 for their material, a value at the thermodynamic limit of what is possible. The crystals form perfectly with almost no tiles missing or ajar, and the material is self-healing. Protein tiles easily pop into place, given the right chemical conditions. “This is protein design using a highly chemistry-based approach,” Tezcan said, noting that the materials are made via a streamlined, minimalistic design strategy that requires few alterations to the protein building blocks. “These materials are very easy to make, yet provide many new research directions both in terms of materials applications and understanding the fundamental principles of nanoscale self-assembly,” he added. Other authors of the paper include Yuta Suzuki in Tezcan’s research group, David Restrepo and Pablo Zavattieri of Purdue University, Timothy Baker, a professor of chemistry and biochemistry and biology at UC San Diego, and Giovanni Cardone in Baker’s research group.